This salad wins the grand prize for my current favorite salad. Of course, I love that it’s fast, easy and healthy. But mostly, I just want to EAT IT. The fresh berries and the tangy feta. The toasted nuts and grilled chicken. It’s all my favorite things tossed together and eaten by me. I think I need to make this right now! TIP: You can personalize this salad in so many ways. Substitute some goat cheese for feta. Switch up the berries depending on the current season. Use your imagination! Cut the chicken breasts into strips. Place the strips in a one gallon plastic bag or small container. Pour one cup of salad dressing over the chicken and marinate for one to two hours. Turn on oven to 325 F. Lightly grease a cookie sheet and arrange the pecans on the cookie sheet. Bake in the oven for about six or seven minutes. Watch them carefully or they will burn. Grill the chicken over medium high for five minutes and then flip over. Grill a few minutes more until cooked through. 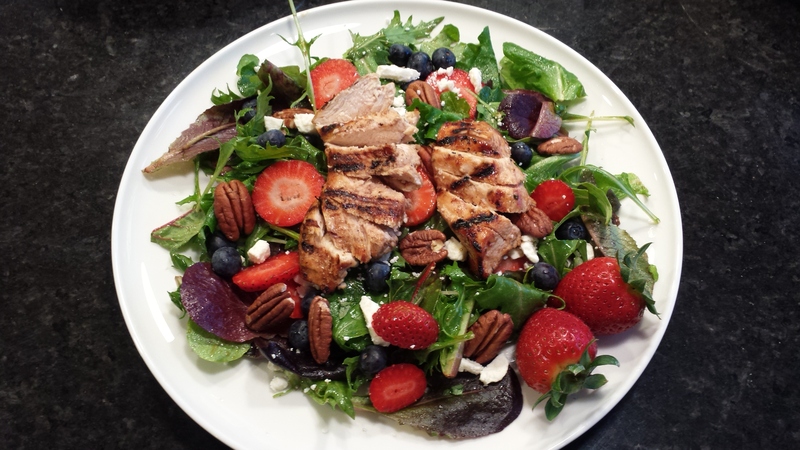 Top the salad greens with the strawberries, blueberries, feta, toasted pecans and red onion. Toss with 1/2 cup vinaigrette. Slice the chicken strips diagonally and arrange on top of the salad. Add a little more dressing if desired. Enjoy! 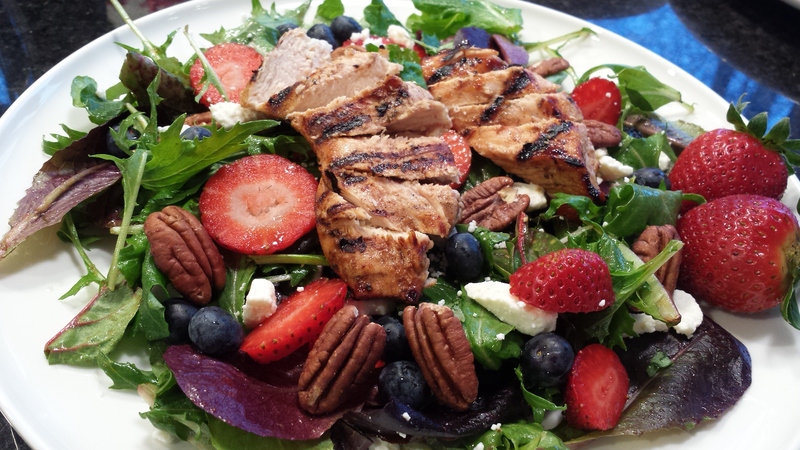 Tags: berry chicken salad, Fresh Salad, Grilled chicken salad, Spring salad, strawberry chicken salad. Bookmark the permalink. Looks delicious!! Definitely adding this to my recipe box to try!